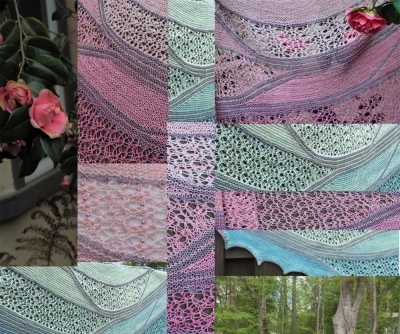 Here are some photos of Stephannie's original shawl, © Stephannie Tallent. What a lovely lovely design! 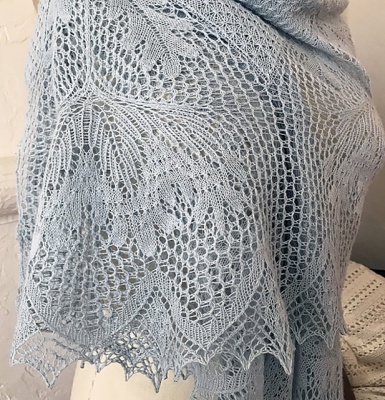 By Stephannie Tallent, this Carpinteria Shawl was inspired by a lovely wildflower native to California, and mirrors its beautiful leaves and flowers. 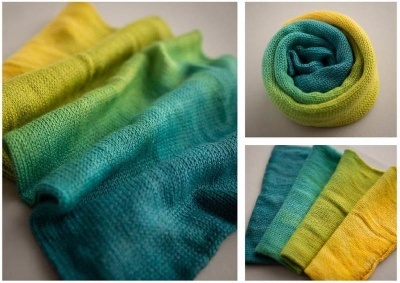 Please make sure to get the pattern directly from the designer on her Ravelry page here. What we have put together are kits of yarn (and beads, if you so choose). 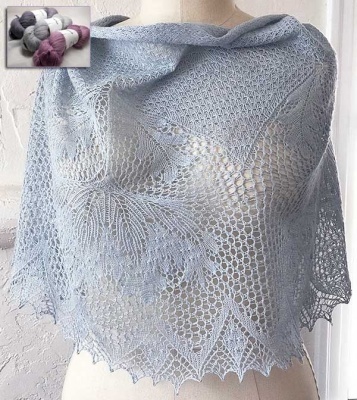 Stephannie writes: This lovely crescent shawl, worked from the textured portion to the lacy edging, features a leaf and flower pattern inspired by Niebling’s Anemone table cloth pattern. Our kits do not offer the same yarn that was used to knit the original. You can see what we have in the inset photo on the top photo and again below that. 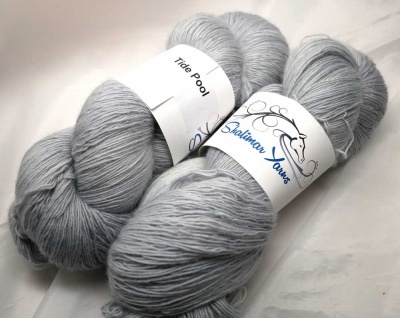 Stephannie recommends between 1,550 and 1,600 yards of lace weight yarn (that's 1417 to 1463 m). Note though that the yarn she used is a lighter lace weight than what we put together in these kits and so though we are giving you comparable yardage, the chances are very high that your finished dimensions will be larger. 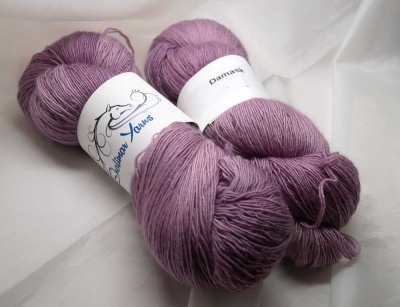 Our yarn is from Shalimar and is called, very aptly, Breathless Lace. Made up of 75% sueprwash merino/ 15% cashmere/ 10% silk, you can imagine how it feels I am sure. Each skein has 850 yards so two will be in each kit, giving you well more than you will need to make this beautiful piece. We brought in a few lovely almost-solid colorways. 1. Tide Pool is a pale aqua blue, though in some lights it looks gray. Gentle and really nice, this will give you a look very similar colorwise to what Stephanie created. 2. 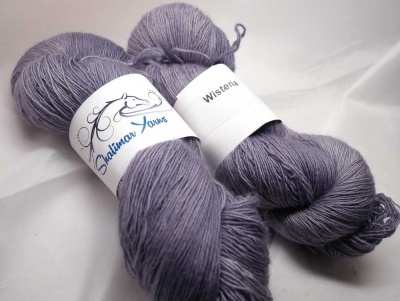 Wisteria is a bit deeper in tone, a violet-gray that sings to me of Victorian parlors. 3. Damask is an antique rose, a lovely look. If you add beads to this piece, it is up to you where and when. The original pattern does not have beads in it but on looking it over, it seems to be that one could add them most beautifully to the edges as well as possibly scattered amongst the blossoms. So we offer the possibility. If you choose to get beads, we will include a 35g container of size 8/0s (that's roughly 1400 beads). Tell me if you have a preference for bead color; otherwise I will choose for you.